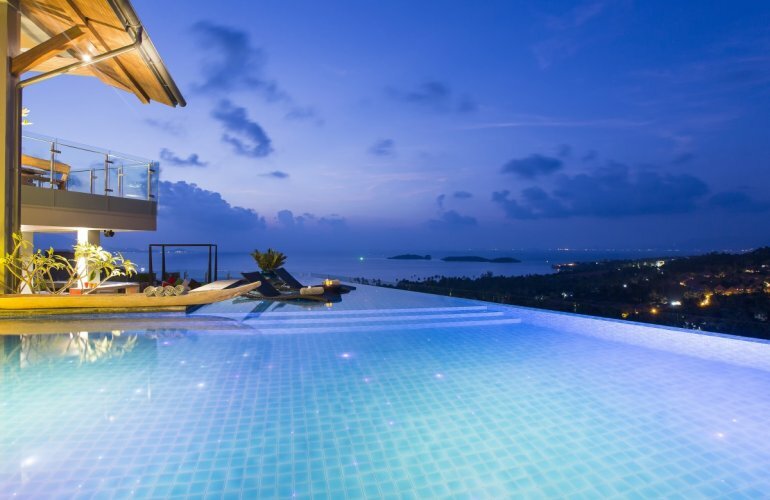 This grand villa in Koh Samui offers the ultimate in luxury island accommodation. Spread across four fabulous floors this huge 8-bedroom holiday home boasts a whole host of fantastic facilities including an elevator, movie theatre, three bar areas, mood lighting and multiple entertainment areas. Located on a hilltop in Choeng Mon the villa offers plenty of luxury living space with stunning views over the local area and ocean beyond. An abundance of space and style makes this the ideal holiday home for families and large groups as well as those in search of the quintessential party pad. An impressive water feature next to the entrance welcomes guests into the villa main living pavilion which has to be seen to be believed. The foyer/lounge room is awash with light and space with panoramic glass doors that fold away at the far end. The room features an array of eclectic furnishings, plants, ornaments and artworks and a lounge area with sea blue sofas that overlook the pool and sparkling ocean below. From here one living area flows effortlessly into the next over multiple levels. To the right a second lounge, richly furnished with reds, offering a quiet space for watching TV, reading or watching the world go by, with panoramic windows that open over the pool area below. A set of stairs lead down to the main pool terrace with its triangular infinity-edge pool, outdoor bar and luxuriant massage Sala. Two further bars are located throughout the villa; one just inside the pool area and another on the rooftop terrace. The unique pool deck is furnished with large reclining sofas and two spectacular carved totem poles overlooking the pool and island vistas - further sun loungers are set up in the shallow section of the pool to keep you cool while you soak up the sun. At night the pool and outdoor bar come to life with colour-changing lights, a state-of-the-art music system, a pool table and LCD TV. Tucked away on the ground level is the designated ‘teen pad’ which is suitable for guests of all ages. The ground floor features three brightly decorated en-suite double bedrooms. These bedrooms share several communal spaces including a lounge, dining area and TV room. This floor also has its own entrance allowing for private access in and out of the villa without disturbing the main household. The home features five further bedrooms; one double room is located on the mezzanine floor, with stairs down to the Master Suite and the remainder of the bedrooms. Each bedroom features a king size bed, en-suite bathroom, elegant furnishings and spectacular ocean views. The master Suite is particularly impressive with its vast dimensions, study area and adjoining twin room. Every bedroom has satellite TV, as do the study, lounge, bar and AV room. The villa is also home to a state-of-the-art movie theatre, complete with 12 plush, electronically operated recliner seats as well as a vast movie screen. Other unique property features include an elevator extending from the car park level at the top of the home, down to the theatre and main bedroom floor as well as numerous alcoves, window seats and chill-out zones. This spectacular home needs to be seen to be believed with its eclectic character, tropical charm, unique design and private patios and balconies. The panoramas from this stunning island home can be seen from all eight bedrooms as well as from the lounges, dining rooms, bars and pool deck. The spectacular views extend across Bang Rak, Plai Laem and the bay of ChoengMonBeach. Guests will enjoy prime views of the island’s amazing sunsets and its most impressive historic sites including the Wat Plai Laem and Big Buddha temples.